Any of my regular readers will know I love to read as I often mention my love for reading in my posts. But inevitably since becoming a mum of three and having a tweenager, a toddler and a baby to look after some days, I don't even have time to brush my hair never mind sit down and read a book. However when I was recently sent the book Falling to review that soon changed. As soon as the book dropped through the letterbox I had a quick read of the first few pages to see what the book was about and that was it, I was hooked. I literally could not put this book down and read it within a day, I was reading it while my baby was asleep on me, I read it in the bath. I even stayed up late at night to finish reading it, and as anyone with a new baby will tell you staying up late is often a thing of the past as sleep is so precious when you are shattered off sleepless nights with a baby. 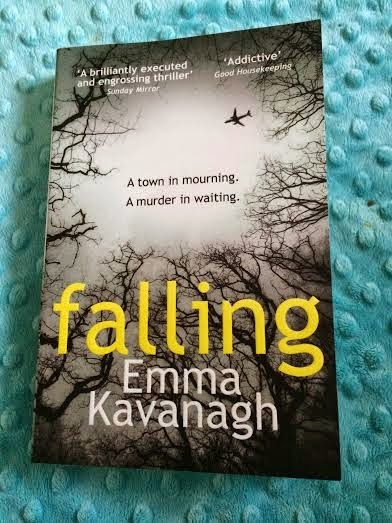 The book follows four people, Cecilia a mother and air hostess who is involved in a plane crash, Tom Cecilia's policeman husband, Jim an ex-policeman whose daughter has been murdered and Freya young women whose father died in the plane crash but has been keeping secrets from his family. The story starts with Cecilia and the plane crash, which she miraculously survives from along with a few other passengers. The story then follows Cecilia, Tom and Freya as they deal with the aftermath of the crash. The story also follows Jim, a retired policeman who learns his daughter has been murdered and is being investigated by Cecilia's husband Tom and whose murder is in some way linked in with the plane crash. I do not really want to say too much as I do not want to give the story away, as this is a book that you have to keep reading to find out what happens. Trust me you will want to keep reading. The book is so cleverly written that it easily switches from character to character in each chapter as they are woven into the story so well, even though each character has their own story to tell. This book really does keep you guessing right up until the very end, it has so many unexpected and exciting twists and turns that you just have to keep turning the pages. The characters are so believable, there is so much detail that you can tell it is well researched and such a believable work of fiction. This is not the kind of book that I would normally choose to read, but even though it is about a murder and a plane crash this book is not all doom and gloom. Even though in places it can be heartbreaking it can also be rather uplifting, you end up wanting all of the characters who have been through so much to come out at the end happy. I really enjoyed this book it is so beautifully and cleverly written. I was actually rather disappointed when it came to an end as I just wanted to keep on reading, each page just made me want to find out more about the characters personal lives. I would highly recommend this book to anyone as I think most people will enjoy it and it will appeal to anyone. I guarantee that you will be unable to put it down like I was. * Disclosure I was sent this book by Mumsnet book club for the purpose of this review, however, all views of this book are my own.